1987 Alfa Romeo Milano Platinum - If you've been a reader of this site for awhile, you already know how much I like the Alfa Romeo Milano (75). I won't bore you with all that stuff again. This is an incredibly nice, low mileage Milano. I still remember the day back in 1988 that I drove my Milano off the lot. It was close to new (8000 miles) and everything about it was cool. It was a great feeling. This car might come close to giving me (or you) that same feeling. Located in Gervais, OR, click here to see the eBay listing. A big thanks to JaCG reader, Mike, for sending me the link to this car. 1975 Citroen GS Pallas - Here's a car you don't often see in the US. (Not that we often see any Citroens in the US.) In Citroen's lineup, the GS filled the gap between the 2CV and the DS (and later the CX). Like the 2CV, the GS has an air cooled engine. Like the DS, it has Citroen's impressive hydropneumatic suspension. Rust was a huge issue with these cars and today they are a rare sight anywhere. This car appears to be in great condition. Located in Berkeley, CA, click here to see the eBay listing. This car is being sold be Eddins Motos. I featured a Lancia he was selling back in November, 2009. This guy works on some very impressive cars and has a great website. It is well worth checking out. You can find it here. 1982 Renault Fuego Turbo - The picture above is without a doubt the worst picture I have ever posted on this site. It's the best picture in the ad. 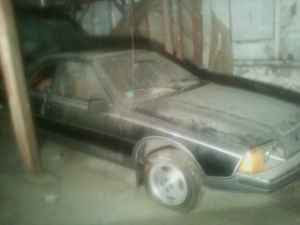 I once owned a 1982 Fuego just like this one. (Well, not just like this one, mine was in better shape.) My Fuego was a year old when I bought it (I have never bought a brand new car) and had very few miles on it. It was a fun car that had loads of annoying little problems. While Renault was at the forefront of turbo technology back in the 1980s, that technology was not very sophisticated and turbo lag on a Fuego can be measured in days. Being a FWD car, it has plenty of torque steer. But, if you keep the revs up and your hands tight on the steering wheel, the Fuego Turbo is a blast. This car has not moved an inch (nor been cleaned) in 19 years. The seller says it won't start. Located somewhere northwest of Boston, click here to see the Craiglist ad. These early turbos were fun cars. I owned a 1980 Mercury Capri turbo once. It wasn't too reliable, but very fun to drive and it was a thrill to feel and hear the turbo kick in. The Alfa appears as though it came from the showroom floor. The Fuego picture looks like one of those "grisly crime scene photos." I'd bring along the local sheriff before opening the rear hatch. The GS is a nice all around car and quite reliable if you have the means to get around the "sphere factor." A good friend of mine had one for a few years. Watching the body rise up as the car was started was an unforgettable sight. At speed, the motor unfortunately sounded like the spin cycle on a washing machine. About the GS - I've had Jaan (Eddins Moto owner) work on my Beta and had a ride in another GS he has that he converted to FI using junkyard parts. I would feel comfortable buying any car from him. I've seen this car in his shop and would be happy to check it out for a serious buyer.